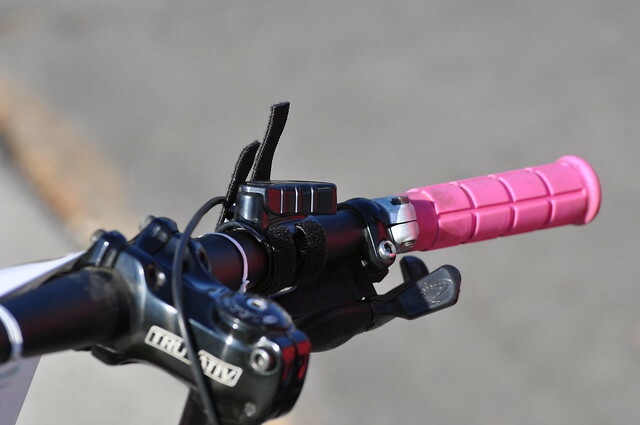 Right after Interbike we got our hands on a demo unit from RideKick. 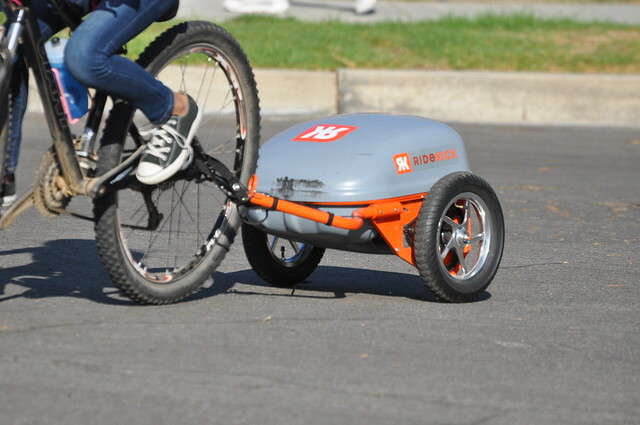 If you’re not familiar with them, it’s basically a utility trailer that has an electric motor which in turn propels any bicycle forward giving it e-bike capabilities. This was our demo unit. My daughter graciously help “model” these photos for me. 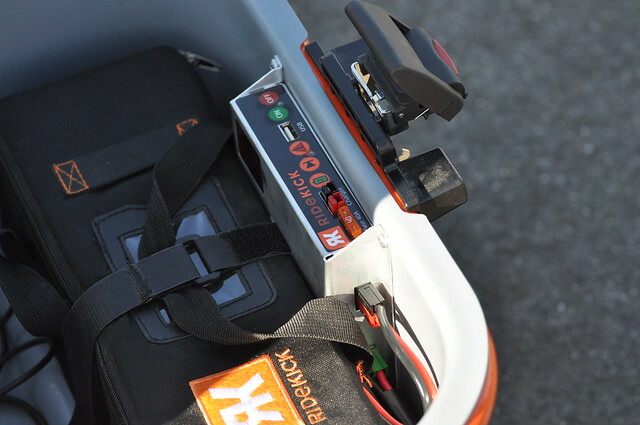 Lead Acid Battery Ridekick Trailer weighs 43 lbs and the Lithium Ridekick Trailer weighs 38 lbs. Cool little feature, the trailer has a built in LED tail light. 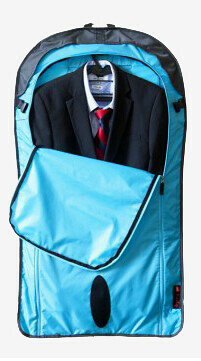 Great idea, but it would have been great if it was bigger and brighter. 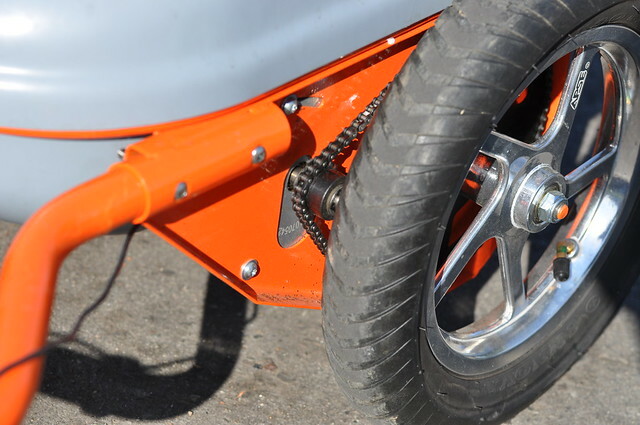 The left drive wheel is powered by the motor via chain. 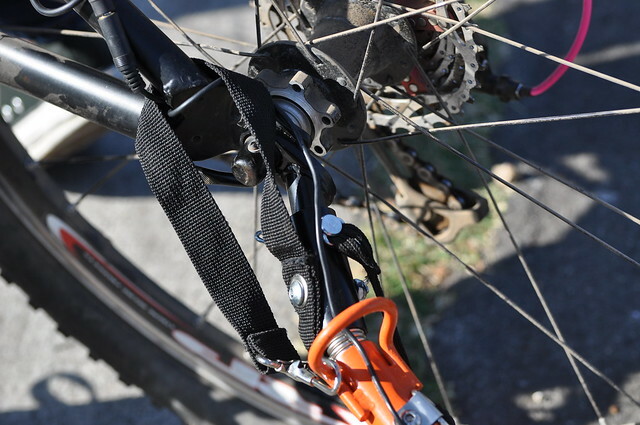 To attach the RideKick, simply place it on the rear, loop the strap and run the throttle control to your handlebar. Access to the trunk/battery compartment is guarded by a combination lock. This area allows you to store all sorts of goodies like groceries, bags and whatever else can fit in there. On a depleted battery, it took 5-6 hours for the RideKick to fully charge. My top speed via GPS was 18.2 miles. The site says it can reach up to 19mph, but I’m sure that could be easily achieved with a lighter rider. I was able to travel 11 miles on a single charge. One of the things I liked about the RideKick was its throttle. Most e-bikes will surge forward as soon as you twist or hit the throttle. But the RideKick will gradually increase speed. So that means if I’m at a stop sign, I hit the button; it will start moving and within a few feet will be up to 100%. It’s a bit of a safety feature if you think about it. The RideKick is pretty fun device. 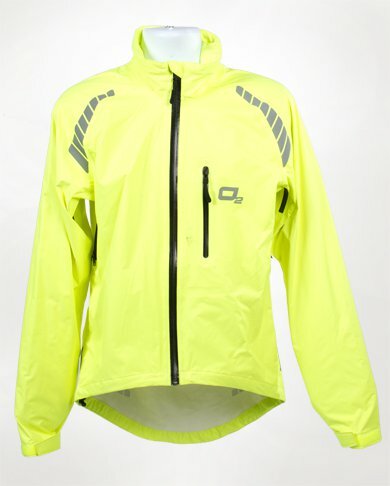 It allows the rider to carry extra cargo in its trunk and get ample speed if needed. The price for the trailer ranges from $699 to $1359, depending on features. 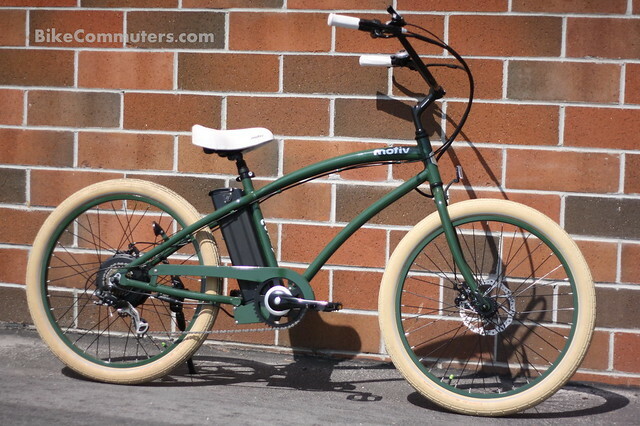 To some this may be steep, but if you compare it to other e-bikes out there, it’s relatively affordable. Most e-bikes start with a price point over $1000, and they’ll charge you an extra few hundred for battery upgrades and etc. So how does this feel when you ride it? It’s a blast! The Ridekick is very stable and when you weigh it down with load, it will bounce less. During our testing period, we took it through various terrains such as street, grass, dirt and gravel. On the street is where the RideKick excels, but on wet grass or loose gravel, the drive wheel will spin out due to lack of traction. But then again, I really don’t think it was made to ride over that terrain. The only thing I really didn’t like about the RideKick was its size. Granted, it’s a trailer, but having to store it if you’re not using it or even when charging it will require some space. Lucky for me, I have garage with ample room, but for folks with limited space who live in apartments or smaller homes, this might become cumbersome. I need to mention that our demo unit suddenly died during one of our tests( jumping off the curb). I sent an email to the folks at RideKick and a person named Mike W. responded. He reassured me that the issue I had was nothing but a connection that had gone loose (from all the times we were hopping the curb). All I had to do was open the battery bag and reconnect it. Sure enough when I check it, that was exactly the problem. So if you decide to get one of these, you’ll be in good hands if you ever have any technical issues. Overall, we were pretty pleased with the RideKick Trailer. It performed well during our tests and their customer support was excellent. 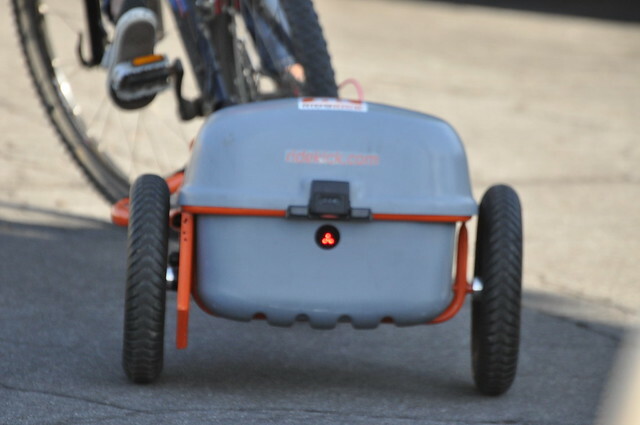 So if you’re in the market for an e-bike, you may want to consider the RideKick Trailer for the mere fact that you’re investing into something that will attach to any of your current bikes and gives you room to carry a small load. The advantage of going with this trailer versus getting a whole new e-bike is repurposing your current bike.